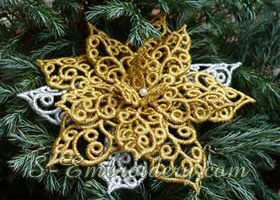 This tutorial shows how you can use our cutwork lace machine embroidery designs to create a doily. 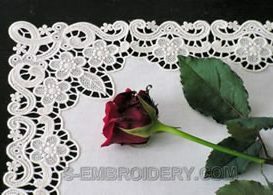 The embroidery design we have used is the Grape Cutwork Lace which is available on our FREE machine embroidery samples page. 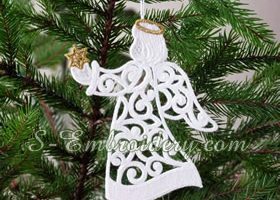 Suitable machine embroidery thread: We find that polyester thread is especially suitable for these designs. 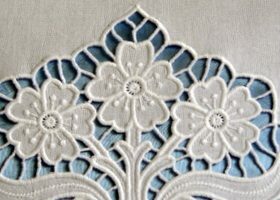 In order to have the stitched out embroidery look the same on both sides, we would recommend that you use the same upper thread and bobbin thread. Suitable fabric of your choice. 1. Hoop the fabric and the water-soluble stabilizer. Make sure they are hooped tight and stay that way throughout the whole process of stitching out. 2. 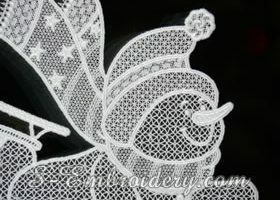 Stitch out the placement of the first stage of the cutwork lace – the inner circle with the grapes. 3. Take the hoop off the machine but do NOT unhoop the fabric. Carefully cut away the fabric. Please make sure you do NOT cut the water-soluble stabilizer beneath it. 4. Place the hoop back and stitch out the grapes and the inner circle. 5. Stitch out the lace placement for the outer circle. 6. Take the hoop off the machine. Do NOT unhoop. Cut away the fabric outside of the outer circle. 7. Place the hoop back on the machine and stitch out the outline. 8. 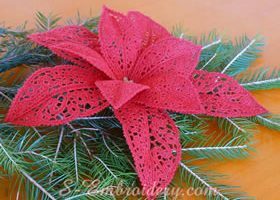 Cut away the excess stabilizer around the doily and dip the doily in water long enough to completely wash away the stabilizer. 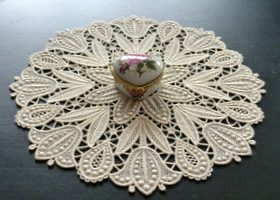 Then let the doily dry on an towel and then iron it. Congratulations! 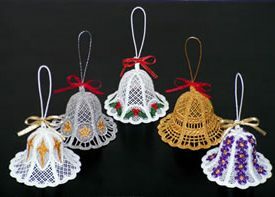 Your grape cutwork lace doily is ready.